The risk of an accidental fall increases rapidly with age, and higher levels are evident in people living alone, people with existing medical conditions, and people living in more deprived areas. Most falls occur within the home. There were 3,259 emergency hospital admissions due to falls in 2012-13 in Devon for people aged 65 and over. 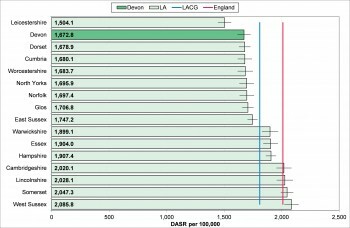 The age standardised rate per 100,000 was 1672.8 in Devon, which is below the South West (1875.6), local authority comparator group (1809.9) and England (2011.0) rates. The rate in Devon is the second lowest in the South West and the second lowest in Devon’s local authority group, as illustrated in figure 10.5. Within Devon rates were significantly lower in Mid Devon (1363.2). Rates have fallen on 2010-11 levels (1737.6). 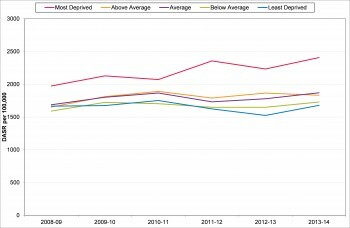 Age standardised admission rates have remained consistently higher in the most deprived deprivation quintile. 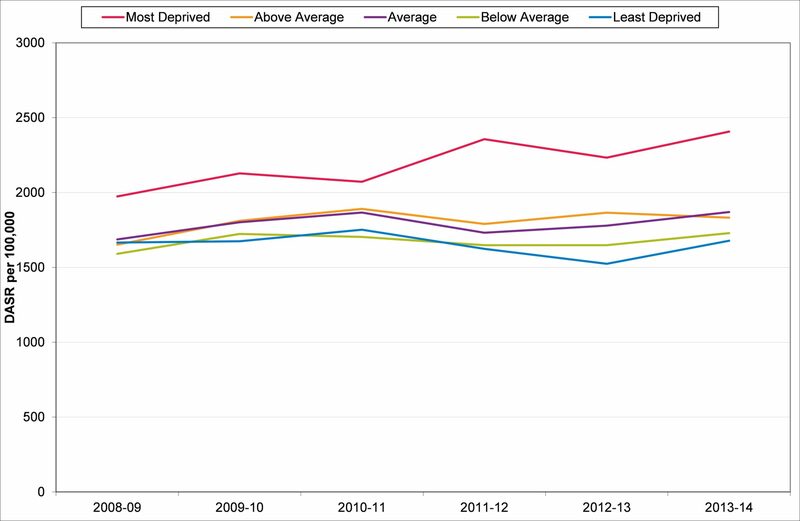 Whilst the gap narrowed in 2012-13, the rate in the most deprived areas (2233.1) was still 47% higher than the least deprived areas (1523.9) as shown in figure 10.6. Rates increase sharply with age with an age-specific rate of 484.2 for persons aged 65 to 69, compared with 6146.8 for those aged 85 and over.